Nine-year-old Daichell Brown was riding in a car with her mother in Clinton, Maryland Monday evening when her mother's car crashed with a car traveling in the opposite direction. 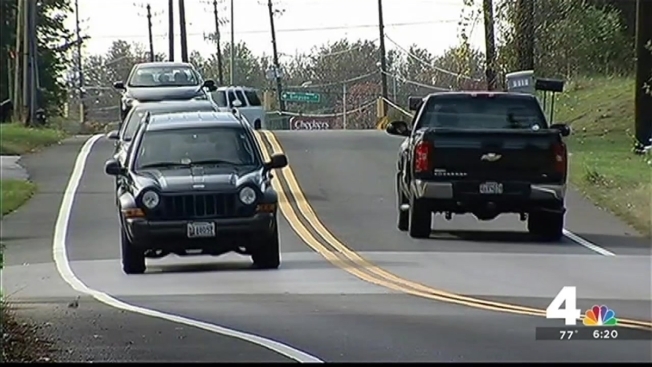 The violent crash killed Brown, and days after her death, Clinton residents are pushing Prince George's County officials to make the intersection where the collision occurred safer. The crash happened as Brown's mother tried to make a left turn from Woodyard Road onto Canberra Drive, police said. Her BMW slammed into a car and flipped. The corner has long had a reputation for being dangerous, neighbors said. "My wife was hit here last year, the same way," Dr. James Dula of the Burberry Hills/Canberra Civic Association said. Neighbor Lauren Green said she witnessed another crash there. "The accident before this, it was a moped," she said. "He actually flew off into my neighborhood, right here in my yard." Brown's death brought hundreds of people to the corner for a vigil Thursday night. "It's very hard because [Brown] was a very friendly girl," Green said about the mourners. "Everybody knew her." "My first day of school, she treated me like a friend. She treated me like a sister," classmate Synique Malone said. After the candles burned out, residents said they want officials to prevent another death. Dula said residents began pushing for a stop light or other changes at the corner at least a decade ago, when adjacent streets opened and increased traffic volume. What was once cow pastures is now homes, and growth has outpaced infrastructure, he said. "We're no longer rural, we're residential now," he said. "Since that time, just about once a month we have a serious accident here." Clinton residents have spoken with county executives about the issue and created a petition, but their request was denied, Green said. Residents are suggesting a stop sign, the widening of the road, rumble strips, better signage or a lowered speed limit. "I hope we can get something done about it," Dula said. At the vigil for Brown, more than 400 people signed a new petition asking for traffic improvements. Locals said they will now go door to door to build support and try to prevent another tragedy.